I first came across the Kington Railways whilst on a railway journey from Cheshire to the West Country via the North and West route. A journey that my family and I made every summer, throughout the 1950’s and until 1964, to spend our summer holiday with my maternal grandparents. Rolling into Leominster station you couldn’t help but notice the large running in board, which advised travellers to ‘Change here for Kington, New Radnor, & Bromyard’, or words to that effect. I made a mental note to look those places up when we returned home, then forgot all about doing so. In the summer of 1964 I was unaware of the Kington Railways impending closure, and the following September work began on lifting the track. Dr. Beeching was innocent for once, for the fate of the line had been sealed long before he took office. A few years later I came across a couple of photos by Ben Ashworth in ‘The GWR Branch Line Album, by Ian Krause. Those photos showing 1420 at Kington, and at other locations on the Presteign branch must have made an impression on me, for when I started the search for a modelling project fifty years later, they immediately came to mind. The Kington Railways comprised the Leominster & Kington branch, and those that left Titley Junction, to serve Presteign, Eardisley, and New Radnor. The line to Kington swung away from the ex LNWR / GWR North and West mainline at Kington Junction, which lay just to the north of Leominster station. The line then passed through the Herefordshire countryside, and into Radnorshire by way of Kingsland, Pembridge and Titley Junction. At 13 miles 28 chains long, and with a ruling gradient of 1 in 60, the line was constructed with the intention of providing an alternative route between the West Midlands, South Wales, and Aberystwyth. Several proposals had been put forward to extend the line beyond New Radnor, all being taken seriously by the GWR who actually authorised three possible routes to be surveyed. One would have headed towards Builth, whilst others headed for Newbridge-on-Wye, and Rhayder on the Central Wales, and Mid Wales lines respectively. Unfortunately, like so many other over ambitious schemes the plans came nought, the line ending in a field on the outskirts of New Radnor. However all was not lost for the railway provided a means of bringing cheap coal into the surrounding areas, resulting in a dramatic drop in the price per ton. The railway also benefited the lime quarries at Dolyhir near Kington, allowing the Old Radnor Trading Company to send its products far, and wide, cheaply and quickly. Apart from the produce of the lime quarries, the railway also provided an outlet for other goods such as iron, timber, wool and sugar beet from Pembridge when in season. Map of the original Kington Railways before the branch to Eardisley was lifted. The proposed extension of the line from Presteign along the Lugg Valley, which is the subject of my modelling interests is represented by the hatched line. The branch from Titley Junction to Eardisley was an early casualty, suffering the ignominy of having its track lifted twice. The first occasion being in 1917 when its rails were rumoured to have been shipped to France to help the war effort. However it is claimed that they never reached their destination, as the ship carrying them was sunk by a submarine in the English Channel. Once the war was over the GWR was persuaded to reopen the line, as a new sanatorium was opening near Almeley, and the local farming community had also been lobbying the Ministry of Agriculture to have the line reinstated. Eventually their wishes were granted and the line reopened for goods traffic between Lyonshall and Almeley in September 1922. Passenger services commenced in December of the same year with three trains a day, one of which was mixed. The line never carried much traffic, and by 1930 closure was looming once again. Timber from the Forestry Commissions estates in the area did generate some traffic, despite the many complaints about the poor loading facilities at Almeley and Lyonshall. Alas the outbreak of war again in 1940 gave the GWR an excuse to close the line for the final time. 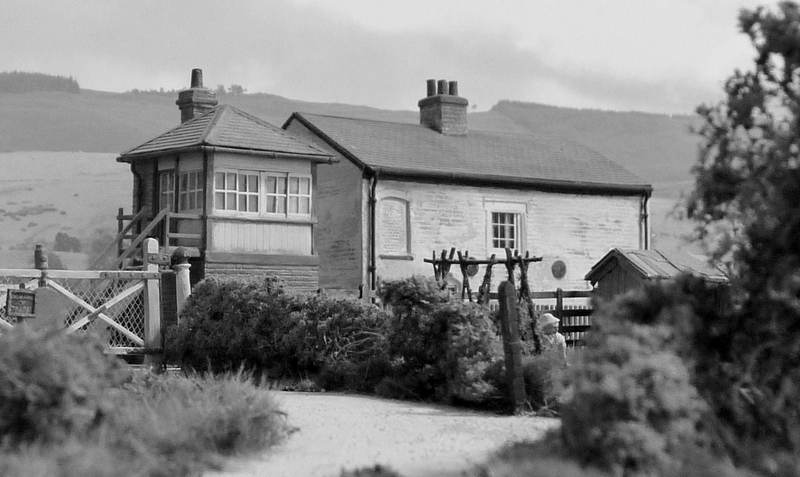 Eardisley station building was dismantled, and transported to Welshpool, where it now stands at the Raven Square terminus of the Welshpool and Llanfair Railway. The coal shortages of 1951 lead to the temporary suspension of passenger services to New Radnor and Presteign, but they were never reinstated and eventually withdrawn, a very convenient excuse if ever there was one. Services between Leominster and Kington survived a little longer, but by 1955 they too had been withdrawn, leaving the pick up goods between Leominster, Kington and Presteign to linger on until September 1964, sometimes only running as required. Then the Kington Railways, like so many others before it passed into history. I was hoping to add some photos, track diagrams and timetables, but issues relating to copyright put an end to that idea. So I’ve included a link to Kingsland Life, where you can find more information, an interesting story or two, a few photos, and a track diagram of Kingsland station. Midway between Kingsland and Pembridge, a siding left the main line to serve RAF Shobdon. Originally an army camp, Shobdon had its own station, which served as a reception point for hospital trains from Southampton during the second world war. The first trains to arrive carried injured troops, evacuated from the beaches of Dunkirk. Today the airfield, which has an unusually wide runway is managed by the Herefordshire Aero Club, and little remains of the former No.5 Glider Training School that was once based there. On the outskirts of Pembridge, which was the next station along the line, trains passed a small private platform called Ox House, which served Shobdon Court, home of William Bateman-Hanbury. He was a successful financier, who formed the company that built the Leominster & Kington railway. Was known for its sugar beet, large quantities being dispatched by rail when it was in season. The track layout, and signalling underwent many changes over the years. With its two loops, and two signal boxes, the layout of the whole station was a little strange to say the least. Since the publication of ‘Byway to Llangunllo’ article in the June 2017 issue of the Railway Modeller, Mr Anthony Davis kindly contacted the editor with the following interesting information. To add further confusion, when the signal box beside the crossing was closed in 1958, the goods loop became the main line again, and the loop of 1879 was removed! Reference to the track diagram should, hopefully make all that much clearer. When the line was initially inspected, by Colonel Yolland for the Board of Trade, he refused to authorise its opening for public traffic, because a level crossing had been constructed at Pembridge instead of a bridge. So it was necessary to obtain a second act legalising the level crossing, before the line could be opened for passengers. Was the last stopping place before Titley Junction, and comprised of nothing more than a short wooden platform, and a very basic shelter. The task of extinguishing the platform lamps falling to the guard of the last evening train. Lay a further two miles along the line, but before the station was reached the branch from Presteign swung in from the right, running parallel with the line from Leominster until reaching the station, thus giving the appearance of a double track. Titley was a rather isolated spot, and didn’t even have a mains water supply, so water was originally delivered daily in churns until 1947, when an old six wheeled glass lined tank wagon was installed on one of the sidings. The other siding being used at one time by the Old Radnor Trading Company. The junction, and entry to the sidings was controlled from a signal box which contained 37 levers, only 26 being in use, the other 11 being spares. I have read elsewhere that the box had a frame of 60 levers, but I’m told that is incorrect. The box is believed to have been closed in 1958, and the goods yard the following year. Around the same time the connection between the Leominster line, and the Presteign branch was moved further eastwards, to a point where the line curved away for Presteign. Titley Junction prior to its closure, now a mere shadow of its former self . Once trains had rejoined the mainline on leaving the branch from Presteign , the connecting point had to be clipped by the train crew. The station building still survives today as a private dwelling, along with a short section of track known as the Kingfisher line. The history of the Kington Railways can be found in the interesting book on the left. There are also several interesting captioned photos of the Kington Railways in ‘Branch Line Byways Vol 1, The West Midlands’, by G.F Bannister. A few articles have also appeared in the model press. ‘Presteign, A GWR Station Worth Modelling’ by Roy G Perkins appeared in the May 1969 issue of the Model Railway Constructor. More recent articles have appeared in the Railway Modeller ‘Adapting New Radnor’ by Paul Marshall-Potter, can be found in September 2010 issue, and ‘Byway to Llangunllo’, a two part article by myself appeared in June / July 2017. The first article covers The Kington Railways, with a selection of photos taken at different locations along the branch, and several track diagrams. The second article appeared the following month and featured my layout Llangunllo. If you have fallen under the spell of the Kington Railways, the book shewn ( GWR spelling) on the right will be a must. Though long out of print copies can often be found on the internet. A DVD is also available from Micheal Clemens as well as several books. Three lines in Herefordshire are extensively covered by archive film from the JIM CLEMENS collection showing the rural atmosphere of working steam railways from 1959 to 1964. The lines seen are Leominster to Kington and Presteigne, the secondary line from Hereford to Gloucester via Ross On Wye, the last steam freight from Ross On Wye to Lydbrook Junction and the Ledbury to Gloucester line. Motive power seen comprises Panniers, Prairies, Auto tanks and Collett 0-6-0 types along with a GWR Diesel railcar. These lines are now history and a way of life is gone forever for the rural communities these lines served. Most of this film is in glorious colour and authentically sound-tracked with recordings made at the time. This is complemented by an informative commentary as a fine record of these lost routes.